Liberals sure like to think themselves as non-racist. What hogwash. They're far more racist than conservatives, and here are just a couple of recent examples. 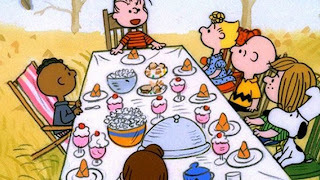 You see, Franklin is sitting by himself, and he's seated in an uncomfortable folding chair. Therefore, racism! Before this outcry, when I saw a picture of the Peanuts gang, I didn't see a black kid. I saw the Peanuts gang. I don't see a white receiver and a black receiver. I see Theilen and Diggs. However, liberals don't. All they see is skin color, because that's what matters. Until we stop looking at skin color, we're going nowhere with regard to race, and given how liberals are performing, we'll be going nowhere for a good, long time.